The idea of ‘Going local’ is growing ever more popular in the US fashion industry with consumers demanding to know where their clothes are manufactured. Now All American Clothing Co. has announced a collection that we can trace back to their origin. This means that each pair of jeans made can be traced all the way back to the American farmers who grew the cotton via the internet using a trace ability number, giving the idea of local production a modern edge. What a great idea to prove the jeans are indeed all-American. The retailer prides itself on producing clothing that is ‘Grown and Sewn’ in the USA, and this idea remains at the core of the company. With the aim of supporting American families and jobs by “producing high-quality clothing in the USA at an affordable price” the website says that this ensures jobs and taxes help to support local communities. That's fine & Good that they are making Clothes in America . I don't consider that Eco . Cotton has a pesticides. it needs to be Organic cotton. I've been fighting the Controlling garment industry for years. Transparency ? you left out a lot important facts. The idea of 'Going local' is growing ever more popular in the US fashion industry with consumers demanding to know where their clothes are manufactured. Now All American Clothing Co. has announced a collection that we can trace back to their origin. 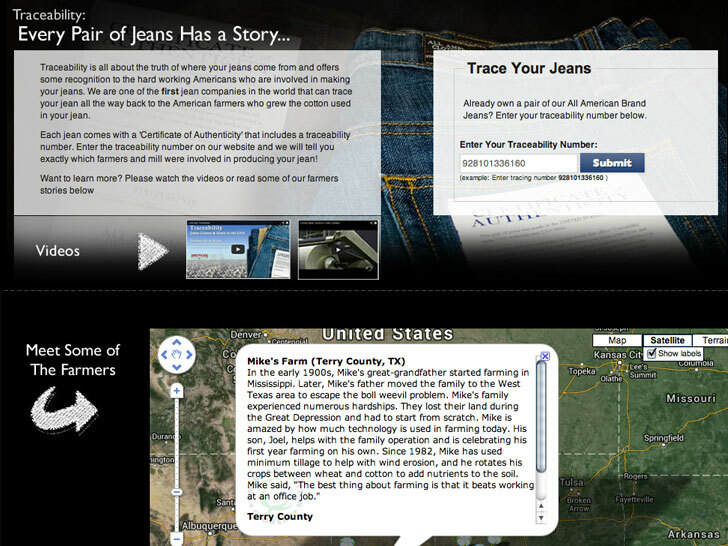 This means that each pair of jeans made can be traced all the way back to the American farmers who grew the cotton via the internet using a trace ability number, giving the idea of local production a modern edge. What a great idea to prove the jeans are indeed all-American.